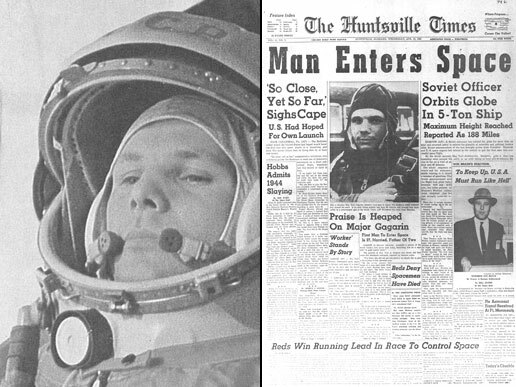 Yuri Gagarin and the front page of the Huntsville Times after the first man enters space. April 12 is the day the Soviet rocket Vostok 1 lifted off from Baikonur Cosmodrome. The payload for this mission was Yuri Gagarin who became the first human to leave Earth’s atmosphere and enter outer space. Gagarin’s flight was short. It only lasted 108 minutes from launch to landing and only went around Earth for a single orbit. His craft was stocked with 10 days of supplies just in case the retrorockets did not function as planned and he would be forced to wait until the craft re-entered the atmosphere on its own. The spacecraft was controlled automatically or by instructions uploaded from ground stations and the onboard controls were locked since the engineers had no idea how humans would react under weightless conditions. A couple of engineers clued Gagarin in on the codes to unlock the controls prior to launch by sealing the codes in an envelope in the capsule or outright telling him. At 9:07 am local time, Vostok 1 lifted off. Gagarin radioed “Poyekhali!” (Russian for “Let’s go!”) as he launched into history. He completed his orbit, but the cables attaching his descent module to the service module did not separate properly. This caused his module to shake violently as it re-entered the atmosphere. In spite of this, he ejected safely from the capsule at nearly seven kilometers altitude and parachuted to the banks of the Volga River. Today, the Russian space program commemorates Gagarin’s flight with a few traditions. Anyone flying into space aboard a Soyuz craft visits Gagarin’s grave on Cosmonauts’ Avenue outside the Kremlin wall in Moscow. Then they visit his office at the Star City museum and sign his guest book. About two weeks prior to liftoff, they stay at the Cosmonaut Hotel in Baikonur. Behind the hotel is a grove of trees planted there by each person who has ever flown into space on a Russian vehicle. New trees are planted prior to launch. The week before launch, they attend a flag ceremony outside the Hotel and visit the museum to sign mementos for their trip. 48 hours before launch the spacecraft is rolled out to the pad on rails. The crew avoids this part as this is believed to be bad luck and instead go get haircuts. The ground crew and personnel will put coins on the rails to be flattened by the weight of the spacecraft for good luck. Launch day is when the crew begins to follow Gagarin’s actions. The night before, they watch the 1969 movie “White Sun of the Desert” which was the movie Gagarin saw before his flight. They wake up, have a glass of champagne and sign the door of their hotel room and sit for a few seconds to calm their minds. Then the cosmonauts board busses adorned with horseshoes which take them to get suited up and head to the launchpad. One the way to the launchpad, the bus is stopped so the cosmonauts can relieve themselves on the left back wheel of the bus, just like Gagarin did. I guess since Gagarin made it back alive, he must have done something right. So why take chances and not follow what he did as close as possible? Even if it does nothing for the success or failure of a launch, it is a great tradition to honor the man who made the first trip. 1997 – George Wald died. Wald was an American biochemist who was awarded one-third of the 1967 Nobel Prize in Medicine for discovering vitamin A is essential for vision and for research into the effectiveness of retina cells to absorb light. He also extracted the pigments from the retina and measured the light absorbance of each pigment. This allowed him to determine the range of color vision possible from rod and cone cells of the eye. 1981 – NASA launched the first Space Shuttle. 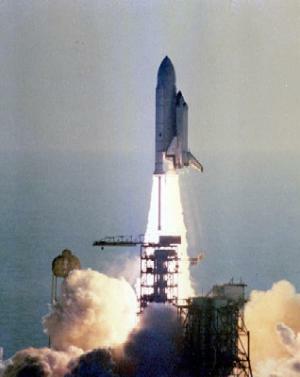 NASA’s Space Shuttle program began with the launch of the shuttle Columbia. This flight was the first manned spaceflight since 1975 and a test flight of the shuttle design. Columbia orbited the Earth for nearly 55 hours and landed successfully. NASA would follow up with four more shuttles to perform many scientific and engineering missions in space. The Space Shuttle program was scheduled for retirement in 2010 but the last flight was STS-135 on July 21, 2011. 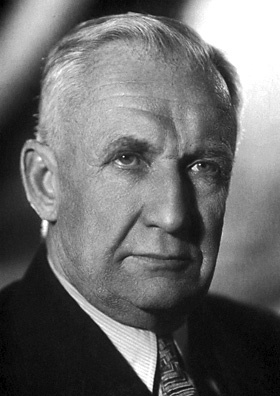 1971 – Igor Yevgenyevich Tamm died. Tamm was a Soviet physicist who shares the 1958 Nobel Prize in Physics with Pavel Cherenkov and Il’ja Frank for their research into the Cherenkov effect. The Cherenkov effect occurs when a charged particle moves through an insulator faster than the speed of light in that medium. The distinctive blue glow of Cherenkov radiation is visible in many nuclear reactor photographs. 1961 – Yuri Gagarin became the first man in space. 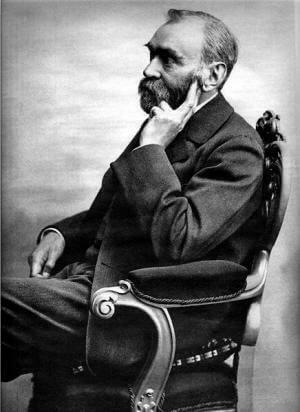 1888 – Alfred Nobel premature obituary appeared in print. Alfred Nobel was the inventor of dynamite and gelignite. A French newspaper reported “The merchant of death is dead” and that Nobel had grown rich by finding ways for people to kill each other faster than ever before. The problem was, they had the wrong Nobel. It was Alfred Nobel’s brother who died, but Alfred did not appreciate the reading the paper’s depiction of his legacy. He decided to modify his will to establish the Nobel Foundation and created the Nobel Prizes to celebrate achievements in peace, science, and literature. Nobel is more known today for these prizes than his invention of dynamite mainly because of this erroneous obituary. 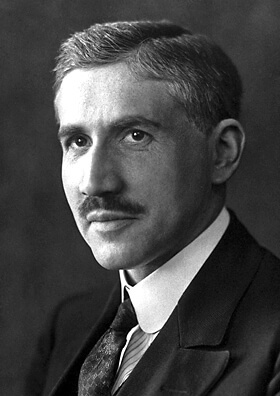 1884 – Otto Meyerhof was born. Meyerhof was a German biochemist who was awarded half the 1922 Nobel Prize in Medicine for describing the way muscle tissue absorbs oxygen and converts it to lactic acid. He discovered glycogen is converted into lactic acid when the muscle contracts. His research led the way to a more detailed explanation of the path from glycogen to lactic acid known as the Embden-Meyerhof pathway. 1872 – Georges Urbain was born. 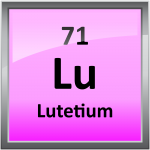 Urbain was a French chemist who discovered the element lutetium. He named the element after the Roman name of his hometown of Paris. 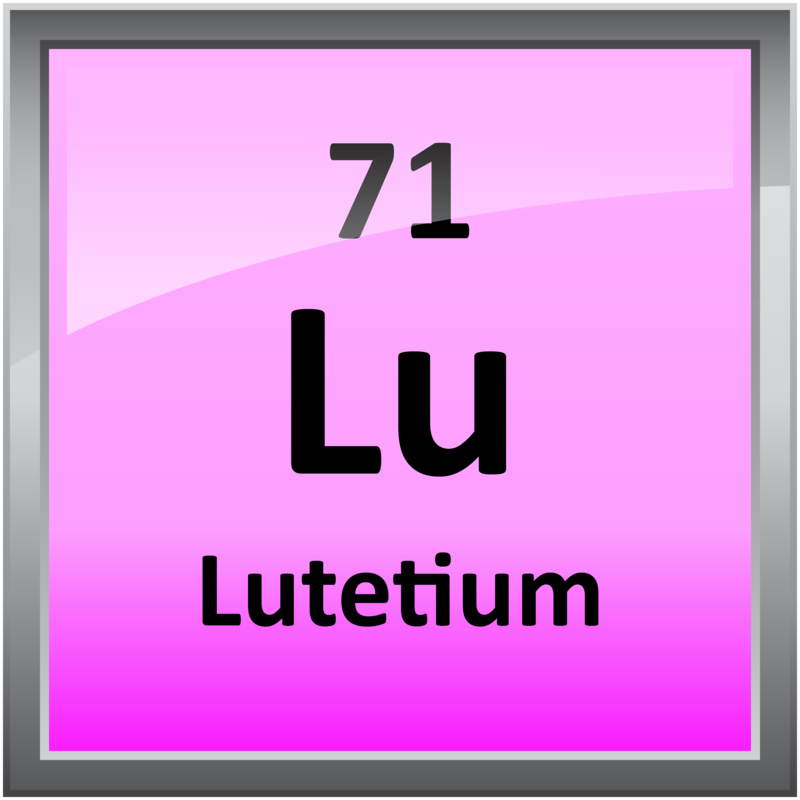 He also produced the first pure samples of ytterbium. 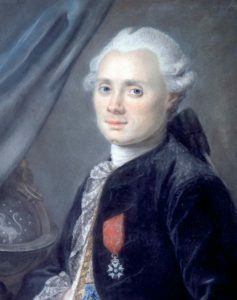 1817 – Charles Messier died. Early telescopes saw fuzzy and indistinct patches of the night sky and were usually called nebulae in texts. In Messier’s time, they were annoyances that got in the way of comet hunting. One of the easiest ways to identify a new comet is by the fuzzy patches of light. He generated his catalog to aid other comet hunters so they would not report these objects as possible comets. Today, we know these objects as nebulas of gas, star clusters, and galaxies. For example, The Crab Nebula is the first Messier object or M1. The Horsehead Nebula below Orion’s belt was known as M17. The Andromeda galaxy is M31. Messier discovered 13 comets during his career.